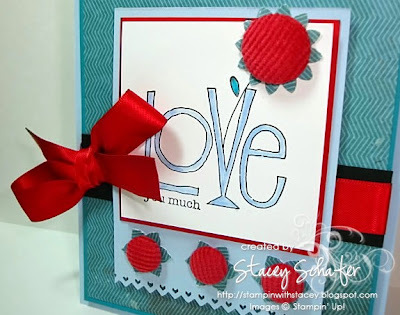 For this "Love You Much" card, I combined two fabulous challenges: Laura's Sketch #44 over at 2 Sketches 4 You blog and Arielle's ColourQ Challenge #17 using a yummy combination of Real Red, Bashful Blue, Taken With Teal, Basic Black & Whisper White. Very fun card! I love that red corduroy brad---really packs a wallop on this card! This is so cute Stacey!! The fabric covered brads are a perfect touch! 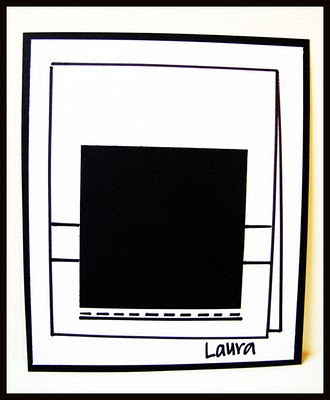 Great job with Laura's sketch! This card is fabulous and I love the color combo I may have to partake. Awesome card, Stacey! I knew I should have bought those brads - lol! 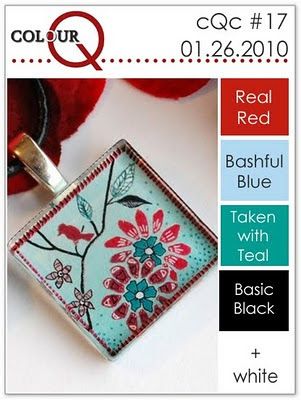 Thanks so much for playing the colourQ this week, you did an outstanding job with the colors! FANTABULOUS!! Love your take on the sketch and the wonderful color combination!!! Very nice card the colours just pop right out at you!